LISLE, IL – October 24, 2018 – Molex, LLC announces today it is an official collaborator for Georgia-Pacific’s (GP) Atlanta headquarters redesign. GP is a leading manufacturer of tissue, pulp, paper, packaging, building products and related chemicals in the USA. Molex innovations will enable the iconic office tower to become smarter, more productive and more efficient. Molex worked closely with GP to address their request to achieve optimal integration, functionality, cost and efficiency among the various systems throughout each floor – Lighting, HVAC, Audio/Visual and Room scheduling systems. This is the first major renovation since the company took residency in 1982. Georgia-Pacific selected Molex based on their extensive expertise in digital building transformation capabilities and the versatility of the Molex system as a cornerstone of the iconic building IoT foundation. The Molex infrastructure allows deployment of a variety of sensors in an economically feasible manner over its connected ethernet-based network. Office spaces within GP’s building will utilize data aggregated from Molex sensors, devices and space zones, and share it with the other building systems to drive efficiency, space utilization and predictive maintenance use cases. For example, the use of occupancy sensors and temperature sensors integrated into Molex’s connected lighting system are also used by the scheduling system, HVAC, and AV to offer a purposeful automation and user-based response. The building is transformed to respond to user needs in terms of comfort, functional work environment and efficiency. The building utilizes bio-dynamic (circadian) lighting in the office and collaboration areas, driven by Molex’s network connected lighting management. GP will have the ability to respond to peak electrical demands by adjusting building systems. The interconnected system allows the company to collect accurate, real-time data to better understand how the space is utilized, improve employee productivity and satisfaction, and maximize their real estate investment. “Our solution capabilities enable architects, engineering consultants, building owners and managers to optimize building functionality and maintenance to benefit occupant experiences. The collaboration between Molex and Johnson Controls to create the next-generation of integrated building systems for Georgia-Pacific demonstrates our commitment to collaborate with industry leading building technology companies like Johnson Controls to seamlessly meet our customers’ interests to have proven, open and industry-standard solutions, said Mike Picini, vice president, Network Connected Solutions,” Molex. 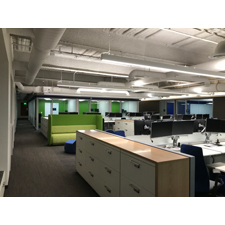 The GP Center systems use an innovative Power over Ethernet (PoE) connected lighting solution for the building that was designed and developed by Molex and Johnson Controls and leverages technology from Cisco Systems. The IoT/Molex Digital Building network integrates with Johnson Controls’ Metasys® building automation platform to deliver a highly secure solution which can monitor light levels, temperature, air quality and detailed occupancy information for a completely connected environment. Integration with Metasys® included a testing phase in Johnson Controls Integration Hub. The future-ready technology will enable GP to more effectively leverage the data for continued building-optimization. For more information about the Molex IoT/Digital Building Lighting Network, please visit www.molex.com. To learn more about Georgia-Pacific, please visit http://www.gp.com/.